Global equity markets pushed higher, with emerging markets posting the best results. Yields on the 10-year Treasury note increased, as investors returned to the equity market. The unemployment rate held steady at 3.7%, while wage growth improved to a nine year high. The S&P 500 Index recorded solid gains, up 2.5% during the week, as ten of the eleven underlying sectors turned in positive results. The gain halted the benchmark indexes string of weekly losses at four while pushing the year to date figure back into positive territory. 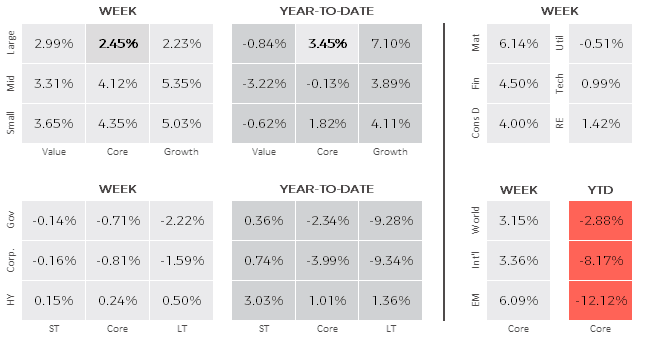 Small cap stocks outperformed large cap while growth generally bested value across the market capitalization spectrum. Materials, financials and consumer discretionary stocks led the way, while utilities, technology and real estate stocks lagged. The quarterly earnings season neared conclusion with figures from 74% of the S&P 500 now reported. As of the end of the week, earnings have increased by nearly 25% from a year before, only a modest slowdown from 25% gains in the first two quarters of the year. The yield on the benchmark 10-year Treasury increased sharply from 3.08% at the end of trading the previous week to 3.22% at the close Friday. The increase in yields pushed bond prices lower, especially for longer-term Treasuries that are particularly sensitive to interest rate changes. The earnings season is winding down with 76 companies in the S&P 500 reporting earnings this week. Important economic data include a read on service sector PMI, the release of consumer sentiment and a report from the FOMC on the direction of interest rates. That said, the mid-term elections will garner considerable interest as they will provide some clarity on the future balance of power in Washington.